It’s been a big week in the Euroleague but even after the Wednesday and Thursday games, there will be more than enough games on Friday to keep you interested and excited. One of the biggest games of the early stages of the Euroleague campaign takes place in Moscow when two teams with a 3-0 record go head to head. Moscow are on a run of 5-0 in their last five games, so they will clearly be coming into this game with a great deal of confidence. This includes a 3-0 record in the Euroleague and you will expect CSKA Moscow to strengthen their lead at the top of Group B. Sonny Weems is on 46 points for the campaign so far while Milos Teodosic has served up 44 points in the Euroleague so far. Mind you, they are up against a team who are sat just behind them in the group, with Unicaja Malaga also holding a 3-0 record, sitting 5 points the Russian side with respect to points difference. Malaga also hold a 5-0 record in their last five games, including a 3-0 record in the Euroleague, so there is something that will have to give in this match. Ryan Toolson has offered up 38 points for Malaga in the Euroleague this season, Fran Vaquez picked up 36 points and Mindaugas Kuzminskas has offered 35 points so far, so there are a number of players who have been on form for Unicaja Malaga. This is going to be one of the biggest games in the Euroleague this week so if you want to see two big teams battling it out, try and find the time to catch this game on Friday evening. With respect to the head to head, CSKA Moscow hold a 4-1 record dating back to 2011, so it is easy to see why there is an expectation that the Russian side will go 4-0 in the Euroleague this week. This is why the odds of CSKA Moscow at 1.90 with a -11.5 has to be of interest to basketball betting fans. Bet Now! Olympiacos Piraeus hold a 3-0 lead as they head to Belgrade but the home team has a 2-1 record, sitting behind Olympiacos in Group D. This means that a home win will see a change in the leadership at the top of the group, so there is certainly all to play for. Marcus Williams has delivered 52 points in the Euroleague for Belgrade so far while Boban Marjanovic had offered up 49 points. The hopes of the Greek side will fall on Vassilis Spanoulis who has served up 64 points so far, which means that he will be the player that the home side needs to stifle if they are looking to win. 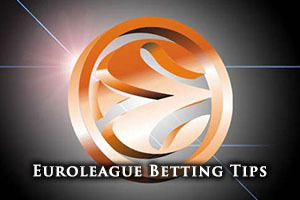 It is sure to be a tight match and the odds of Olympiacos Piraeus at 1.90 for -1 is too good to ignore. Bet Now! The Italian side EA7 Milan will be coming to Greece with a 1-2 record up against the home side that hold a 2-1 record. You would expect that Panathinaikos will have more than enough about to hold off their Italian opponents, who haven’t quite lived up to the expectations of their fans. AJ Slaughter has provided 52 points for Panathinaikos for the Greek side so far in the Euroleague while Esteban Batista has offered up 42 points. Daniel Hackett has provided 37 points for Milan, indicating that scoring points is an issue for the Italian side. With this in mind, you can see why odds of 1.90 for Panathinaikos at -6.5 are an attractive bet for Friday night. Bet Now!